One thing I must admit is that you can never get enough of good Asian food when it is prepared properly. Some may inquire as to what other way can Asian food be done. If you have had any authentic Asian food, and by that I mean cooked in someone’s home, not at a buffet kitchen, then you know the difference. The food is spicy — not necessarily in the manner that it burns when you eat it — but it is full of flavour. There is a bloom to what you eat. You almost do not want to refuse offerings of more. For something quick, many of the express Asian cafes and buffet halls provide something akin to frozen shrimp meals: a lot of crust and the rest is essence. Bite into a shrimp that comes with a frozen dinner and tell me how much actual shrimp you sank your teeth into. That is what you get with a lot of Asian cafes that do not want to offend a common palate. An absence of spices, a hint of flavour, and a lot of questionable output, you may find yourself barking like a dog in protest for having something so anti-delicious. One evening when I had finished work, I went to Oak Park, Illinois, to buy some wine, bread, and cheese from a cheese market that has become a big hit with my culinary sensibilities. It has reached the point where whoever is at the counter addresses me by first name. Yes, I love this particular wine shop so much that I am in there weekly procuring something for my snacking pleasure. But let me not digress. 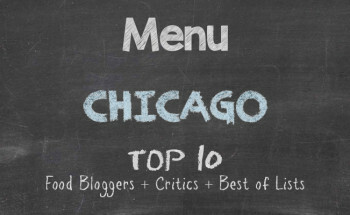 Although the downtown area of Oak Park is relatively small, I had covered most of the eateries in the pedestrian area of boutiques, cafes, and restaurants. But there was one that a friend had mentioned and seeing that there was some outdoor seating that I could take, I opted to follow her recommendation. 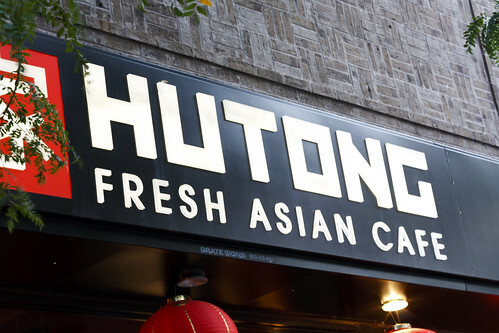 Hutong Fresh Asian Cafe at 1113 Lake Street had the look and feel of the usual boilerplate Asian restaurant. Well, it actually has the canned ambiance of any American get-it-and-go establishment with a dine-in option. Where this restaurant’s impression exceeds expectations is with the output. While they may follow a formula that is popular now among most walk-in restaurants, the cosmetics of the place pale in comparison to the quality of the food that they serve. It may be that the eatery is relatively new, so the greeting from the cashier has a positive light. Then again, the hello with the smile I received may very well have been authentic. At the end of the day, you know people are ready to vacate the premises and go home or wherever. A smile that does not look pained after 6:00 PM is indeed genuine and that makes the establishment that more inviting. Being safe, I chose the Thai option and started with crab rangoon. Not really paying a lot of attention to the menu, I figured the crab rangoon would come as four small pastries stuffed with cream cheese and crab. Much to my chagrin, there were three crab rangoon, but they were delightfully substantial. And when you bite into them and the cream cheese does not projectile about, you know you have just had something worthy of recommending to friends and family. 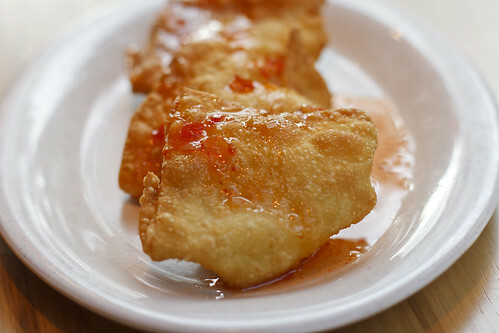 Much like crab rangoon served at Thai restaurants, there was a sweet and spicy sauce that came as an accompaniment. Yes, it was smashing. Not enough to drench the appetizer, it was enough to glaze them and I enjoyed every chomp just the same. With a pure ginger ale in hand, I was quite the happy chap devouring the wonder appetizer. 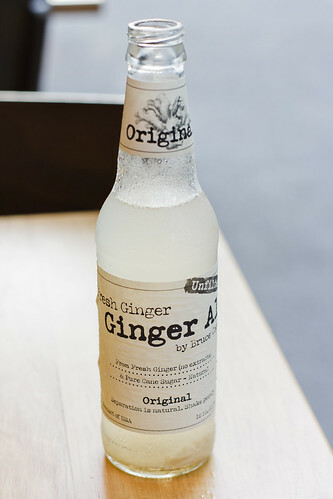 Not that the ginger ale was something to fan and faint over, I will say that I love all-natural products. Seeing pure ginger floating about in the drink and the taste that was spicy but not enough to choke you, I will seek this particular brand in the markets. 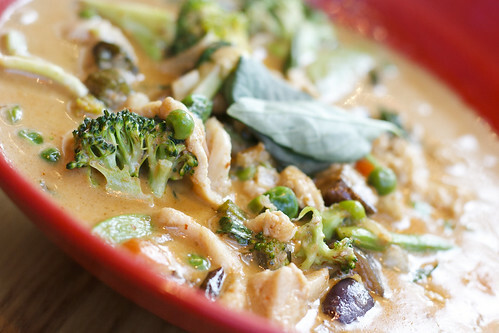 Sticking with the Thai theme, I had also ordered a red curry dish with chicken. As I have mentioned in several other posts, Thai restaurants in Chicago tend to waffle between thin curries and hearty curries. At Hutong Fresh Asian Cafe, the curry was of a consistency somewhere in between. But that was okay. Loaded with green peas, brocolli, bamboo shoots, and eggplant, I understood how the word Fresh got introduced into the name of the restaurant. I kid you not when I say that I believe they have a garden in the back or somewhere nearby that has not fallen prey to the evils of pesticides and growth products. The chicken was fresh, for one, but the vegetables were certainly organic. The colouring and the flavour were all the cues I needed to know that I was putting something healthy into my body. My appetite appreciated it. Looks can be deceiving and American restaurants have now taken on what I dub the Stanley Kubrick formula. Most upscale fast food eateries are applying the look and feel of Chipotle, Roti, Burrito Beach, and the like. While those cookie-cutter establishments have everything sitting in front for review, and you get served in a conveyor belt fashion, Hutong Fresh Asian Cafe does not have everything on display for you to point to while in a queue with other customers. One may argue pessimistically that you have no idea what is coming from the kitchen, but if you can taste the freshness, you can be confident that it is worth the trip to ease on down the yellow hutong road to get something that not only will your appetite thank you for, but also your body.